Nafplion is located in Peloponnese peninsula - est coast, 140 km from Athens, 1½ hour drive from Athens or 20 minutes flight with the helicopter. From Athens International Airport "Eleftherios Venizelos" - Follow "Attiki Odos", direction Elefsina. Then follow the National Road to Korinthos and to Tripolis. 2km after the "Spathovouni" Toll-Post you will reach the "Ancient Nemea / Nafplion " Interchange, where you have to exit the National Road and follow the signs to Nafplion. Please contact us for any further information and arrangements. 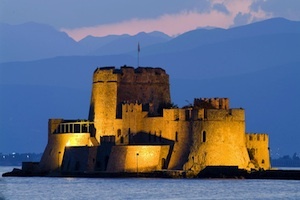 Nafplion enjoys the excellent Mediterranean climate, all four seasons, with balmy springs, warm summer months and a dry mild winter. At Nafplion area, spring and autumn are pleasant, characterized by bright sunshine and occasional rainfall, allows for outdoor activities throughout the year. Comfortable swimming is possible during summer, late spring and early autumn months making the destination ideal for all year round escapes. Temperatures during summer average around 33ºC, whereas over the winter months temperatures average 10ºC.